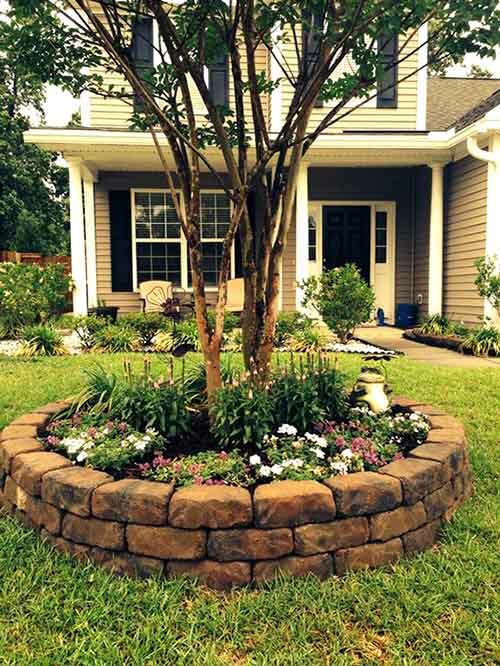 If you’re wondering what to do with old bricks, here are some ideas for Brick Flower Bed Designs that you can easily recreate in no time. Generally, no special skills are required except how to arrange the bricks themselves. 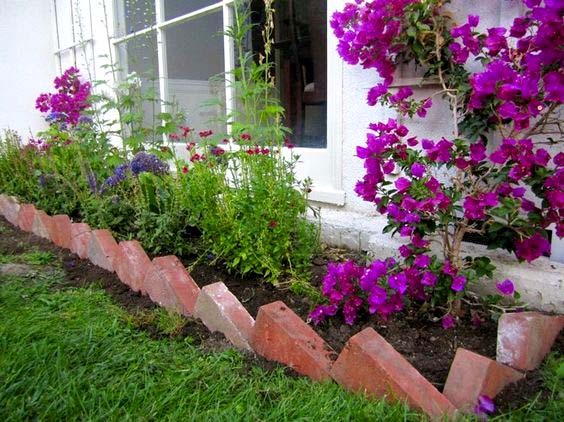 To begin, this is one of the easiest and best-looking brick ideas for flower beds. It would be great both in the front and the backyard and gives a finished look of your garden. Just make a short border with the brings and plant Azaleas or other higher flowers. 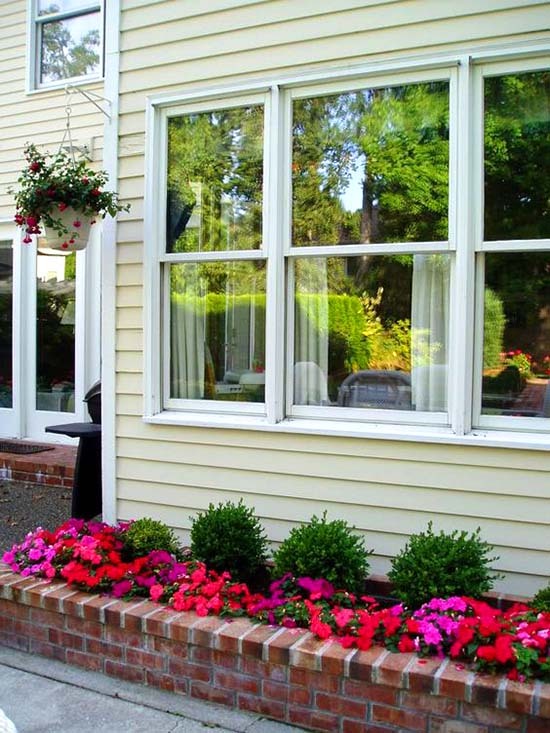 It’s important to keep in mind that around the façade of the house it is usually shady so the plants you pick need to deal well with the lack of sunlight. If you are asking yourself how to build a brick flower bed, there is something creative that may guide you how to set your garden apart. It is very cheap, edgy and stylish in a simple way. 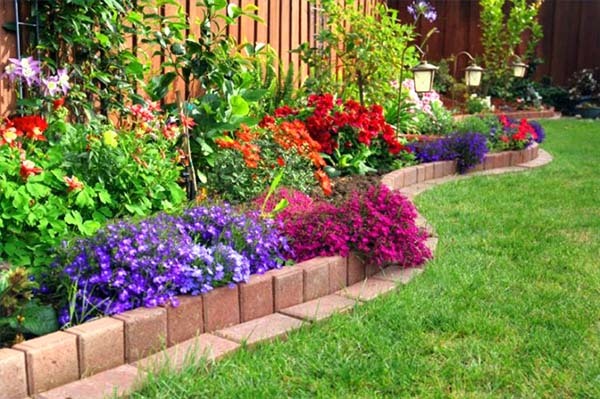 All you need is some old bricks and some colorful flowers that will not grow too high such as Petunias, Lavender etc. The good thing of this design is that you can play with the shape, with the way you lay the bricks and the height of the flower bed. Enjoy! Perfectly adapted to be integrated into the Mediterranean gardens, rustic or modern, the brick border invites itself to the outdoor space to give it a personalized and very original aspect. 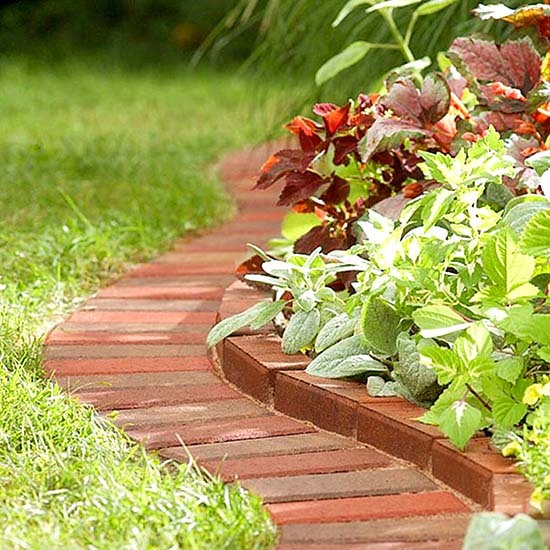 Reunited in a single row or double row, the bricks enhance the edge of the walkway and the flowerbed. Bet on the brick and you will succeed in bringing a touch of warmth and conviviality in your garden. It creates beautiful layers with the windows. Plus, it adds texture to the whole façade. Tip: Pick up plants that make a contrast between themselves (as shown in the picture). While building a raised flower bed with bricks in your garden, think of how much free time do you have and don’t start a project you won’t be able to finish by yourself. It is better to enjoy the whole process of designing rather than suffer, right? For those of you who consider themselves as crazy DIYers, here is a real pearl – a minimalistic oasis in the center of the landscaping. It brings the rustic vintage look and makes the whole space shine. After a crazy day at the office, there is nothing more relaxing than sitting in the garden surrounded by greenery. 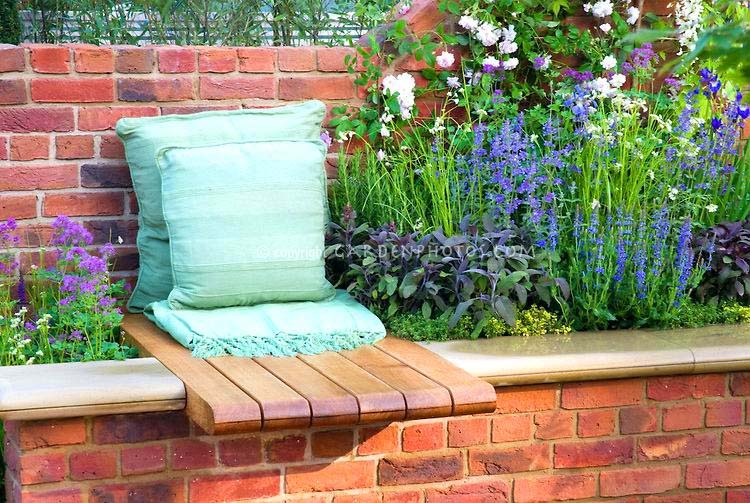 Here is a thought – make a raised flower bed with bricks and add some space for sitting (as shown on the picture). You can make the tiny bench of wood. Tip: Do not forget to polish the wood as it will last longer outdoors. While I was searching for pictures of brick flower bed borders, I found this one with traditional formal style. To make it visually more attractive, you can select bricks in few different colors. Simply stunning, isn’t it? 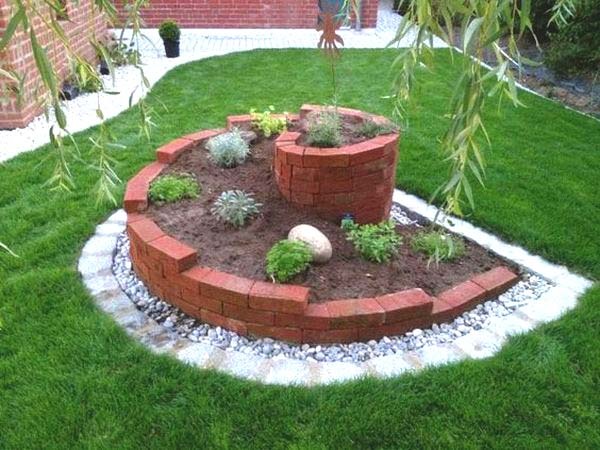 One of my favorite brick built raised flower beds is this spiral herb garden. Why? Firstly, it offers an edge; it also saves lots of space (incredibly suitable for small green spaces!). Last but not least, it gives you the chance to be creative to the foolest and to mix materials. If you want to make a simple garden centerpiece (without spending a fortune), then build a tiny platform from old bricks. 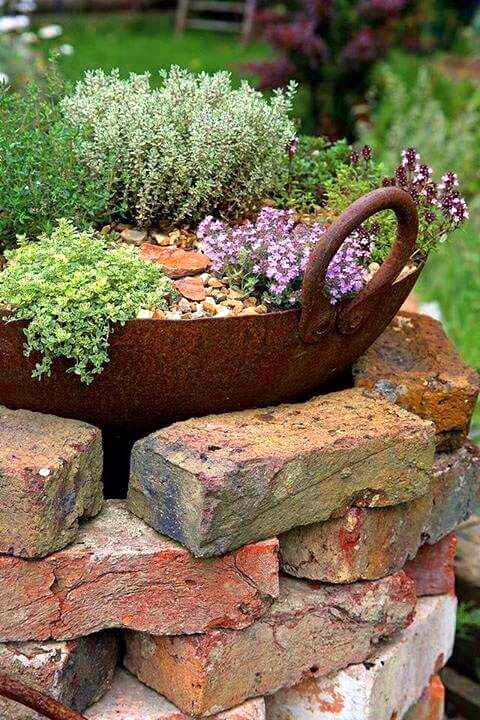 Then, place an old rustic pot with flowers. This will give a new fresh look to the garden instantly. 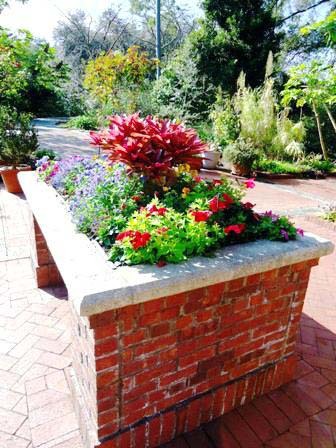 One of my best-loved brick flower bed designs for sure! 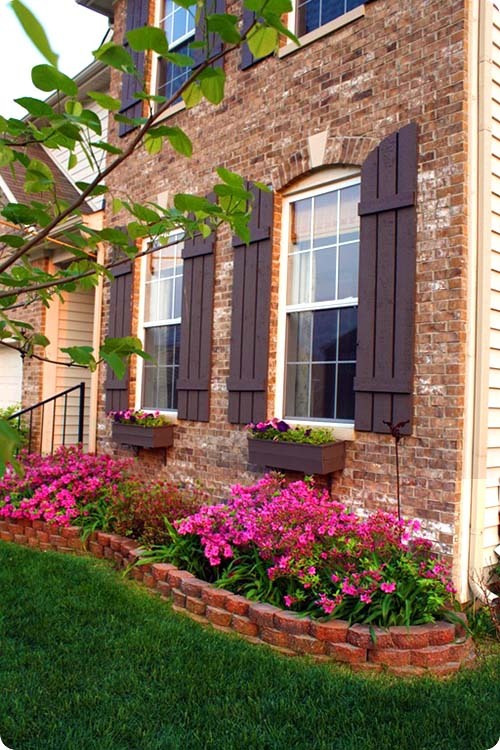 This simple building brick border flower garden is a great way to create an edge around the house façade. Consider using two types of materials – flagstone pavers for the courtyard surface and old bricks for the edging. The best of this design is that it creates a stylish finish touch to both the building and the garden. 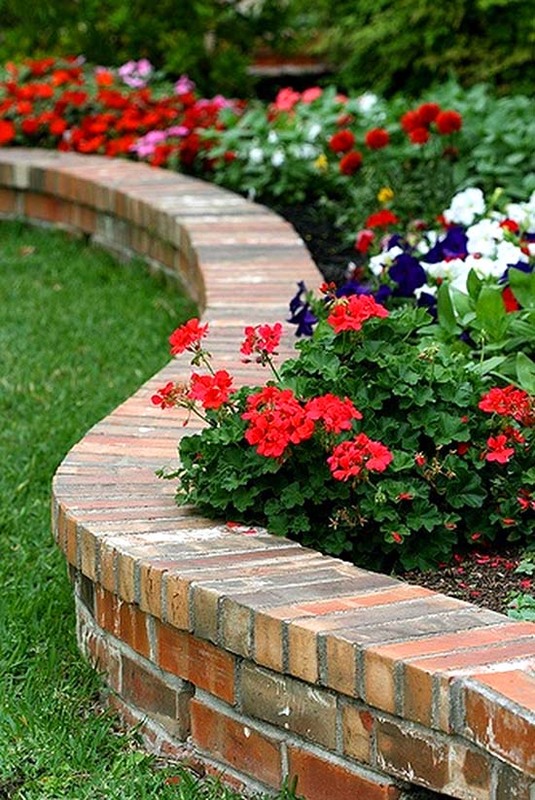 Here is one of the simplest brick designs for flower beds. However, it saves time to be built and it doesn’t require much maintenance. It also creates a beautiful and not too “screaming” border in the whole landscaping. 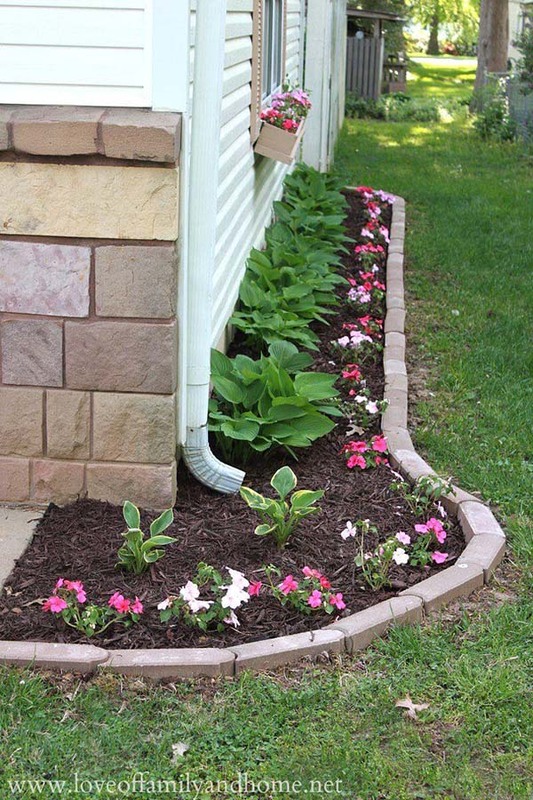 You can really strengthen the look of a flower bed or border with garden edging. Which actually has many other advantages – it doesn’t just make the landscaping look beautiful, but It also keeps the lawn and rambling plants from invading each other’s territory. 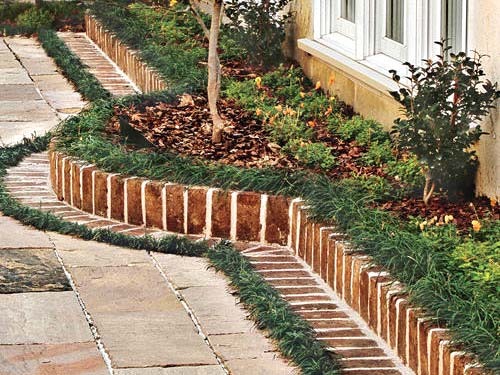 Bricks are considered as the best material to create a permanent premium edging in your garden – they can be installed different ways for different effects. While I was surfing the internet, desperately looking for cool brick raised flower bed ideas, I found this simple plant bed that could easily fit my patio. In fact, these are stones used in the picture, I am now making my own using old brick and it looks even more vintage and more stylish. 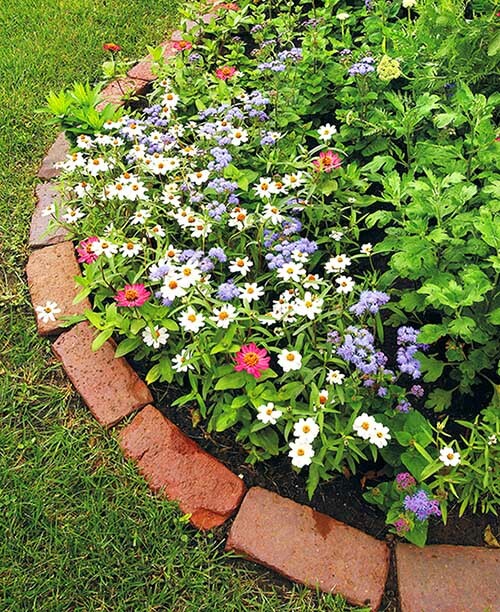 The last idea I will share is especially for those of you who are focusing on brick flower bed border ideas. At first sign, It looks too simple maybe but If you look deeper – It creates a nice delicate border between the lawn and the plants. It also makes the whole landscaping more dynamic and definitely not boring! Last but not least, you can make this brick border for less than few hours.